It’s a few hours in the car for us to get down to Cornwall. My other half’s grandmother lives there so it’s always nice to go down to see her and smell the sea air. On this particular adventure we arrived to the smell of fresh baking in the house and discovered that we were to be treated to a Cornish feast. The first evening comprised saffron buns (bready, a glorious orange and with saffron and dried fruit), figgy hobbin (sultanas wrapped in pastry coated in sugar) and sausage rolls. 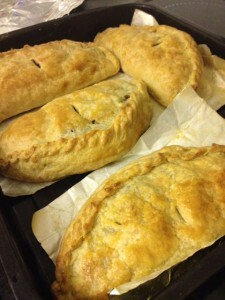 We were informed that the sausage rolls were a test bake to check that the pastry would be good enough for the incredible and massive pasties that we had the next day. What a welcome. I like all the names of places you see as you drive around Cornwall. My particular favourite is the ‘Atlantic Highway’ as it conjures up such optimistic visions of an incredible road surrounded by sea but in reality it’s just like any other bit of tarmac. Still, good to say you’ve been on it. 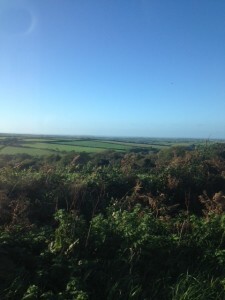 The views (as you can see) are good from wherever you are; blue skies (we were quite lucky), sea and green fields. As we were only down for a few days we tried to cram as much in as possible. 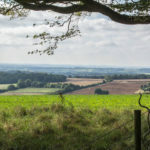 We started with a trip to the Wadebridge Wine Shop which sells some amazing wines from all over the world, beers, ciders and spirits; they have two Cornish gins available there too. Fifteen in Cornwall we had planned a few weeks in advance; it’s in a little place called Watergate Bay which is near Newquay. I didn’t take any pictures of the food or menu as I wanted to relax and enjoy the view and the view really has to be one of the best you could ask for. You can sit and watch people walking, swimming and surfing from the restaurant but you can watch equally well at the little café underneath too. 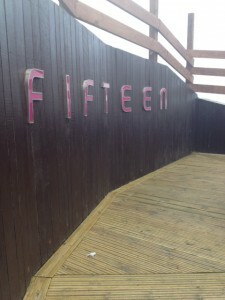 Fifteen itself is light, airy and generally a nice place to be. There’s quite a lot of attempted upselling at every opportunity; little booklets on the table to tempt you into buying some tiny terracotta pots on your way out. I had beetroot and mozzarella salad to start which was nice, as expected. I followed this with hake and greens; the greens turned out to be a mixture of seaweed and spinach which when served with the heavily salted hake has got to be one of the saltiest things I have ever eaten. It was pretty disappointing. Then I had apple cake, caramel sauce and clotted cream. It was ok but the cake was a bit burnt and the whole pudding was just a bit stodgy. The best bit was the peach iced tea that I had to drink; it was really generous with peach puree, tea and elderflower to mix it up. All in all, for the price you are paying I didn’t think it was worth the money, however, the profits go to The Cornwall Food Foundation which I think is a very worthy cause. We managed to fit in a trip to Sharp’s Brewery (which was so much fun it’s getting its own blog post) and we also popped over to St Ives. I think St Ives is probably my favourite town in Cornwall; a great mixture of shops, cafés and restaurants it’s a lovely seaside place to have a good mooch around. I found the above deli which I haven’t seen before and it was crammed full of local produce and all sorts of tempting things. 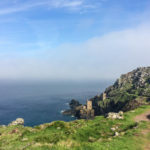 If you are heading down to Cornwall there are a few things that you really should try. Firstly, a Cornish cream tea with a disgraceful amount of clotted cream on your scones. 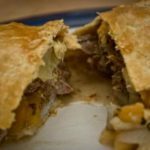 Secondly, a pasty but do try to get one from a butcher or baker as they tend to be cheaper and more generously filled than those from some of the cafés. Lastly, fish and chips by the sea (in any weather) but do watch out for the seagulls otherwise your chips (and/or you) might end up going for an unintentional swim. Beautiful place and that Cornish cream teas sounds interestingly. Se ven deliciosas sus empanadas me gustarìa probarlas,abrazos. 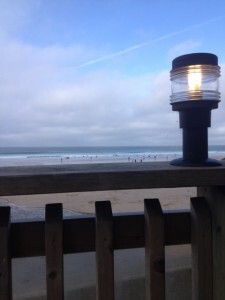 It all sounds wonderful, I love Cornwall and the café below Fifteen is one of my favourite places to have a coffee or snack lunch after a blustery walk along the beach. Those pasties and saffron buns sound like the best food around though. It sounds like a wonderful time. Great photos. 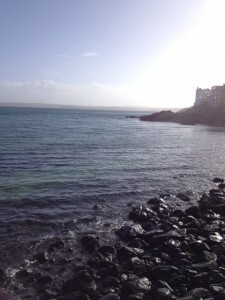 Ah miss Cornwall…. great photos, reminds me of the good old times. I wish I had a grandmother like that! Disappointing about Fifteen but confirmed my suspicions. I’m glad you found something you liked in the drink, though. 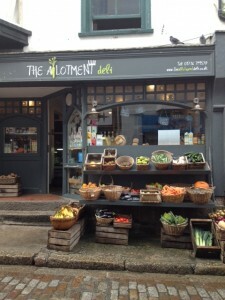 That allotment deli looks wonderful. I’ve never been to Cornwall – would like to go sometime. Loved the pictures! Really fun post – thanks so much. Such an enjoyable trip and love the wonderful treat! Oh my, This looks insane! It looks beautiful. I love the sound of a proper Cornish cream tea and of course, I would love to eat a pasty. I am sure they are different from the ones you get in London!